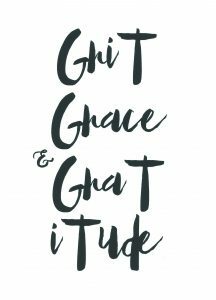 I keep this little poster framed in my office – I believe “Grit, Grace & Gratitude” perfectly sum up what it takes to be a great fundraiser – it’s why I pin it to my Twitter bio. “Passion and perseverance for long-term goals” are vital traits every fundraiser should posses. Here’s why: As fundraisers, our work is magical and fulfilling. But – spoiler alert! – it can be very challenging. Yes, talent, luck and even serendipity play roles in fundraising success. But passion and perseverance goals are key to engaging supporters in our work. A lack of passion, whether for philanthropy, for the nonprofit mission, or for connecting with donors creates inauthentic actions and motivations. Passion isn’t being emotional or waving one’s arms about. I experience fundraising passion as a deep enthusiasm and joy in our work. And joy and enthusiasm create uplifting emotions that are perceptible to donors, colleagues and others around you. As important as passion is perseverance. As donors move through they world, they see problems all around them that they wish to solve. A great fundraiser is able to invite prospective donors to be part of the solution your nonprofit is creating. This is where the magic happens, when a donor moves from observer to hero. We know, however, that supporters are busy – with family, work and a myriad of other commitments. A good fundraiser understands we must move according to the donor’s timing, rather than the needs of the nonprofit. Perseverance allows great fundraisers to build and nurture donor relationships over years. Grit is passion and perseverance. It is courage and resolve. And I know grit is a key trait of successful and ambitious fundraisers. I believe grit is a key trait of successful and ambitious fundraisers. What a beautiful and motivational post, we couldn’t agree with your thoughts more! In our line of work, you won’t succeed without passion and perseverance, things will not always go your way and you will face struggles, but if you remember the passion behind your job and stay dedicated you will see the rewards come through in the long run. We call ourselves, ‘Inspired People’ for the same reason, because we found our work in our love and dedicationt to what we do! You’re spot on. Fundraising is a form of selling, and anyone who work in sales will tell you that being a salesperson takes grit and determination. But having the tools to support your fundraising efforts also helps. For example, nonprofits should embrace technology more. Using tools such as text to donate services can help in so many ways. I read a blog post recently stating that nonprofits will likely raise more with an SMS donation service in the mix than without one.